Normal gums are usually supposed to be pink in colour. However, If you notice that your gums have turned grey, blackish, or white, that is something to be concerned about. While some gum discolouration is natural, sometimes it can become a serious problem, affecting your health and might require serious attention. 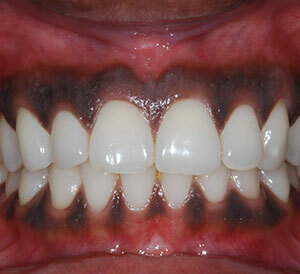 A natural reason for a person to have darker gums, black or dark brown, is because of the skin pigment balance. Just like the skin colour can vary, so can colour of your gums. This occurs due to the increase of melanin production in the body which is normal. Taking certain medicines such as tricyclic antidepressants, minocycline, and metal-based crown fillings, etc. First is acute necrotizing periodontal disease, commonly known as black gum disease. This kind of gum discolouration and turning black happens due to dead Gum tissue. The second condition that darkens the gums making them appear grey is, acute necrotizing ulcerative gingivitis. This disease is a result of poor dental hygiene.